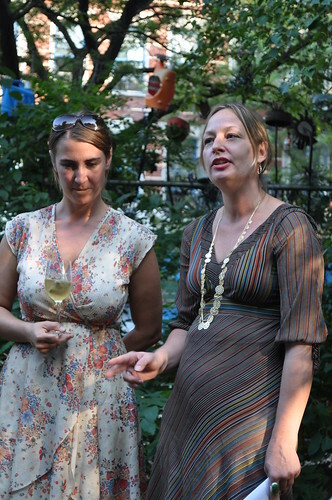 This past Wednesday, Linda and I, along with her husband and two close friends, went to a "farm dinner" hosted by Outstanding in the Field (OITF) and prepared by chefs, Heather Carlucci-Rodriguez and Charles Rodriguez, from Print. 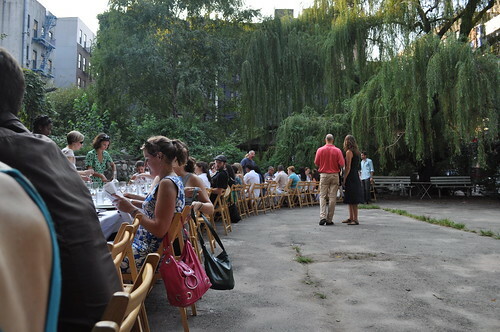 restaurant (located in Hell's Kitchen) held at La Plaza Cultural Community Garden. Linda had told me about this event back in late March (she's been to the last few OITF events held in Manhattan/Queens), so we've had this planned for five months (aka, us talking about how excited we were for it)! So insane how five months can fly by so quickly! Just a brief history before I continue to document the rest of the event from Wednesday night. 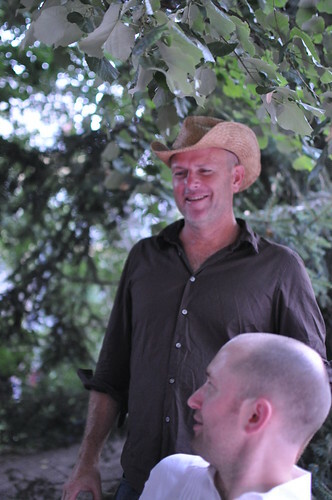 Jim Denevan, the founder of OITF, started this "venture" of his in 1998 when he hosted "farmer dinners" in his restaurant at the time. 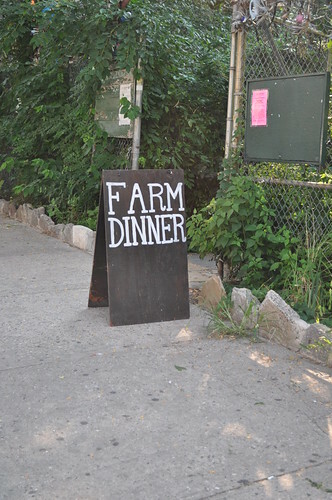 He invited the regular producers "out of the field and into the restaurant", where the menu that night would feature all ingredients directly from the farm. The farmers would speak a little about what they provided tonight, and from there, it started to snowball. The following summer in 1999, Mr. Denevan thought of an even better place to "celebrate the farmer"--right on the farm itself! Thus, started the tradition of long farm tables and BYOP (i.e., "bring your own plate(s)"--more detail later). The subsequent seasons to this first dinner, OITF branched out to other parts of California and an event in New york, then eventually taking OITF on tour through many farms across North America, taking farm dinners "from coast to coast". 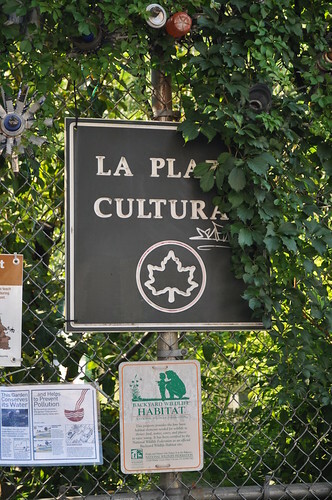 Entrance to La Plaza Cultural in Alphabet City / East Village. 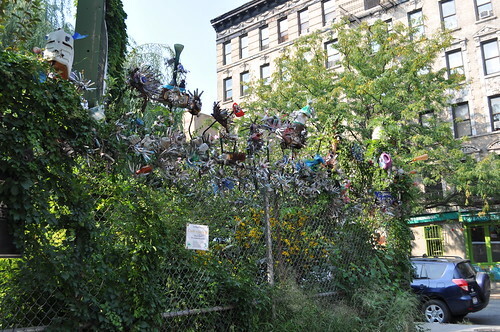 La Plaza Cultural Community Park fence. 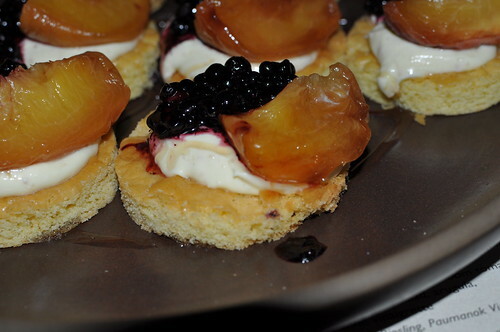 They started us off with three hor d'oeuvres. 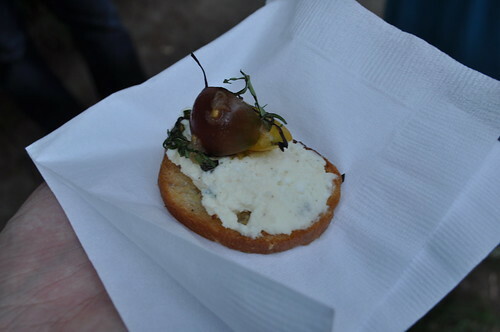 The first was a cherry tomato crostini with Salvatore Brooklyn Ricotta, basil, and olive oil. The ricotta was light yet creamy and the ripeness and sweetness of the cherry tomatoes made it the perfect summer appetizer. Delish! 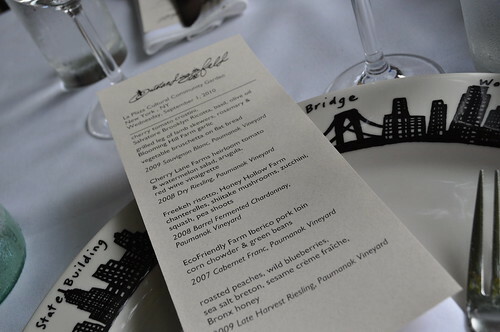 The hor d'oeuvres were paired with a 2009 Sauvignon Blanc from Paumanok Vineyard, located on Long Island in Aqueboque. The rest of the wine pairings for the last four courses also came from this same vineyard. 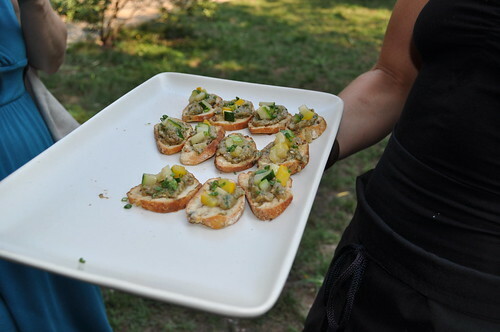 The second hor d'oeuvre was a vegetable bruschetta with eggplant, cucumbers, and peppers on flat bread. I'm not a big fan of eggplant, but Linda, John, and Lynnette said it was good! 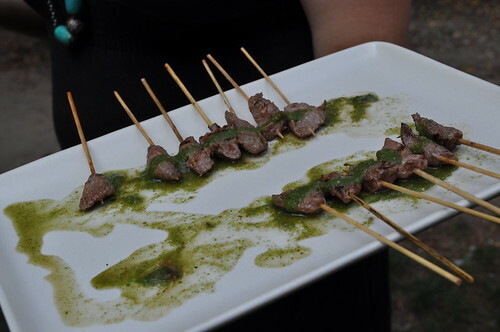 The last of the hor d'oeuvres were grilled leg of lamb skewers with rosemary and Blooming Hill Farm garlic. Nice, hearty flavor. 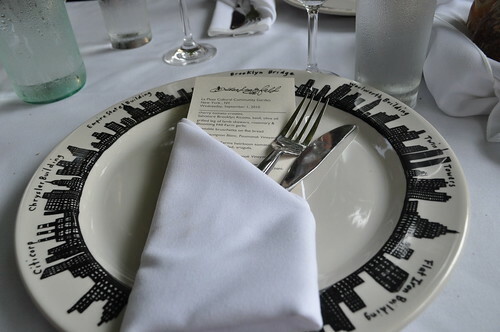 A tradition that still carries on with OITF to this day from the first farm dinner, everyone brings his/her own plate (as I've called BYOP--see history in beginning of post) for eating at the long farm table. So not only do the farmers bring their ingredients to the table--so do the patrons, by adding their own unique taste in dinnerware also! Very neat stuff! 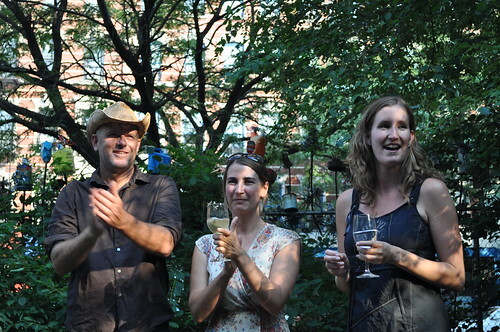 Opening speeches, introductions, history, and the like, featuring Jim Denevan, founder; Katy Oursler, Director of Private Events; and Leah Scafe, Event Coordinator / Organizer. Katy with Marga Snyder, La Plaza Cultural Board Member and Co-Chair of Membership Committee, as she is giving a brief history of La Plaza Cultural. 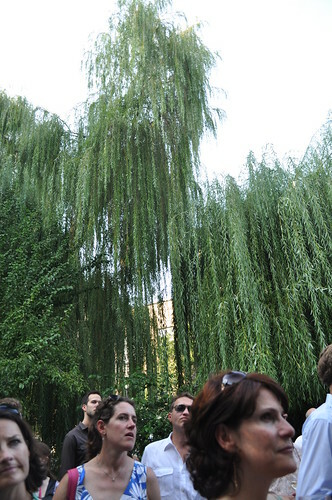 Three years ago, the willow tree on the right had a broken branch fall, and as a result, they had to cut down the tree as a precaution. They weren't sure whether to get rid of the willow's stump, but somehow, three years later (today), it has grown back to this gargantuan size! Amazing! The traditional "long farm table". We were sitting at the first third of it, so imagine another third behind this lens! This was our view of the farm table. 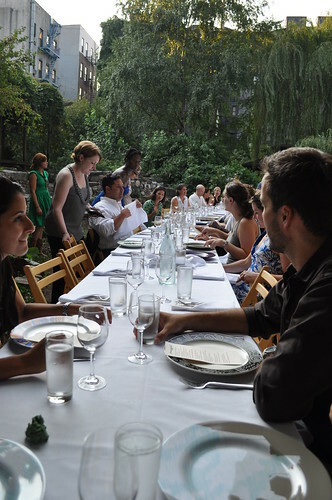 The entire table is separated into groups, or families (as referred to by OITF). 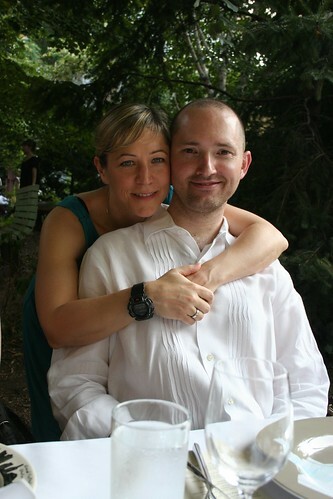 We were very fortunate to be sitting next to a recent newlywed couple, Nyla and Spencer, who both have had pretty intense foodie adventures together. I especially recall discussion about pork belly reubens, the disappointing visit to El Bulli, French fries fried in duckfat, among other things. 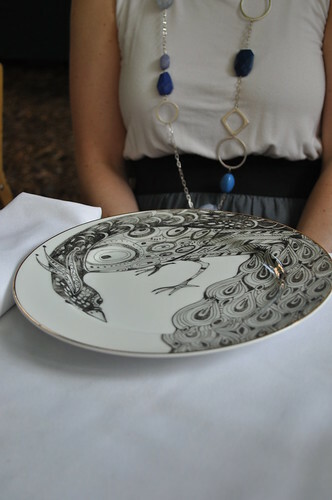 Jess's beautiful peacock plate from Anthropologie (collection available here). 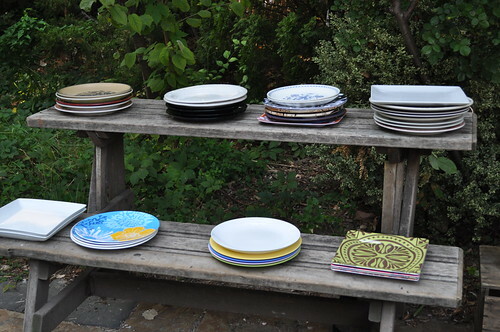 As you will see here, and below, we BYOP'd some pretty nifty plates. Okay, we admit it. We're plate snobs. We went out and bought some pretty awesome plates just for this event. Nothing to be ashamed of--we just wanted to eat in style ;]! But hey, at least we'll have a plate for next year's dinner! This is my plate from Fishs Eddy, as recommended by Shayna (she included this set of dishware on her bridal registry!) and Linda (she mentioned her and John's plates were from Fishs Eddy also). The 5-course menu, including wine pairings. The back includes thank-you's and important people in helping making this event possible! I love making new friends! Linda invited two of her close girlfriends to OITF, too! 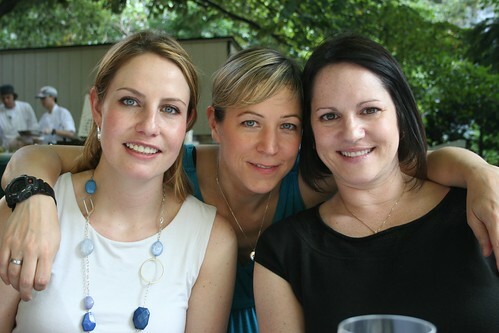 From left to right: Jess, Linda, and Lynnette--photo taken with Linda's camera. Linda and me (from Linda's camera). 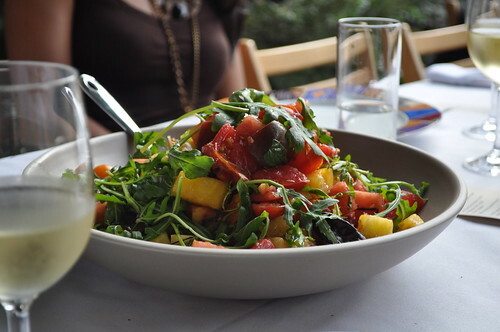 After the hor d'oeuvres, the second course was a Cherry Lane Farms heirloom tomato and watermelon salad with arugula and a red wine vinaigrette. They include the traditional pink watermelon, but they threw in some yellow watermelon as well! Not only did that add more juicy sweetness to the salad, it made the salad colors pop! A great summer salad! This was paired with a 2008 dry Riesling from Paumanok Vineyard, which had a subtle sweetness, which went really well with the watermelon! 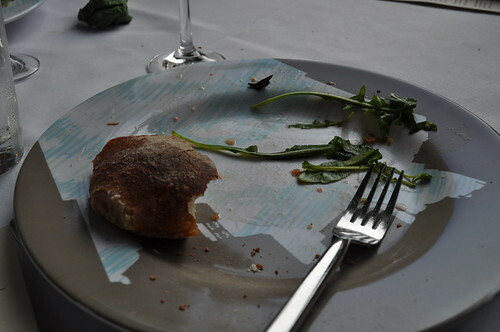 I forgot to take a photo of Linda's plate, so here it is, post salad and bread! Sadly, it is now a discontinued pattern from Fishs Eddy. 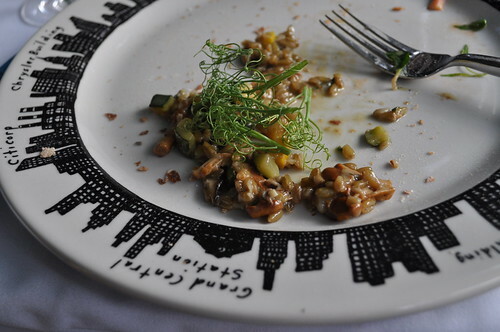 The third course was a Freekeh risotto with Honey Hollow Farm chanterelles, shiitake mushrooms, zucchini, squash, and pea shoots, paired with a 2008 barrel-fermented Chardonnay. This was probably my FAVORITE dish of the night. This may sound weird coming from a no-Parmesan diet gal, this was so easy to eat! 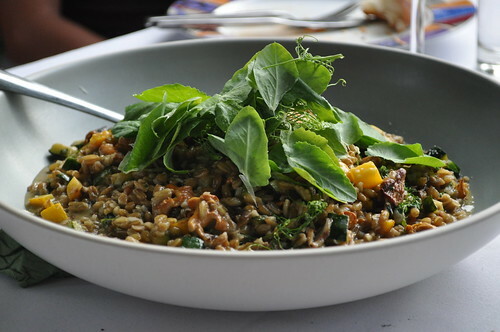 Freekeh, a whole grain, gave the risotto a denser texture to it (as compared to the traditional arborio rice and its mushy-ness/fluffiness) which made it fun to eat, oddly enough! We couldn't really taste the flavor from the zucchini or squash, but boyyy, do those chanterelles deserve a standing ovation! So much character and depth! Ahhh, perfection! I would love to recreate this dish--who's with me?! My attempt at "aesthetically pleasing" plating. 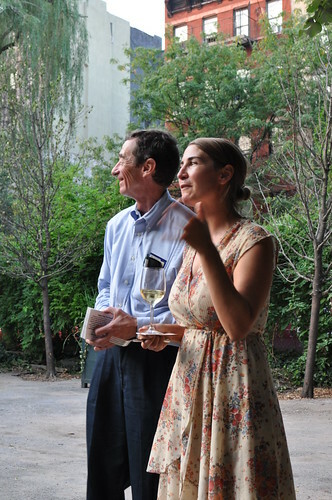 Katy with Roger Repohl, Bronx beekeeper, who provided the honey in the night's dessert dish! 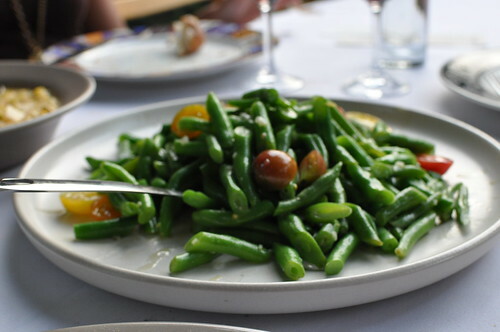 Green beans with cherry tomatoes! 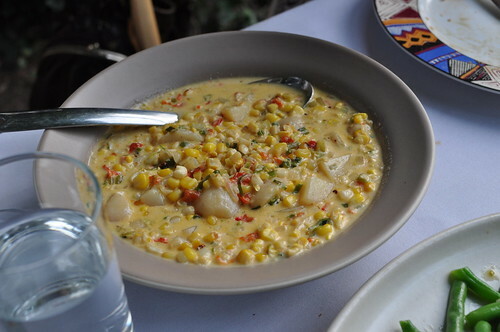 Corn chowder--so many wonderful flavors and ingredients in this dish. Potatoes were cooked to the right softness and the red peppers were a great addition! My only complaint was that it was a bit salty, but still a great chowder! 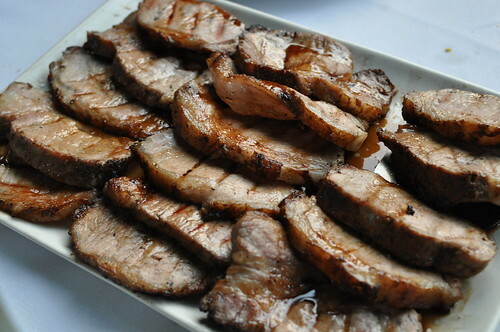 EcoFriendly Farm Iberico pork loin--liked the marinade, but was definitely a little overcooked. However, most of the pieces had a nice strip of fat on them so not all was lost with flavor! This was paired with a 2007 Cabernet Franc from Paumanok Vineyard. 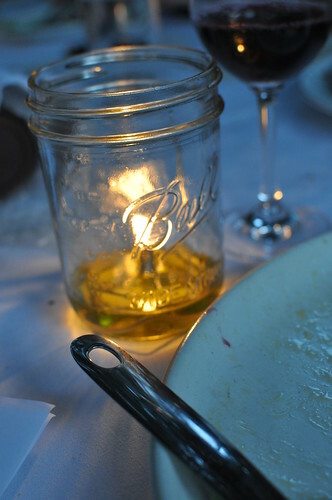 Candlelight by mason jar--gotta love some rustic decor! 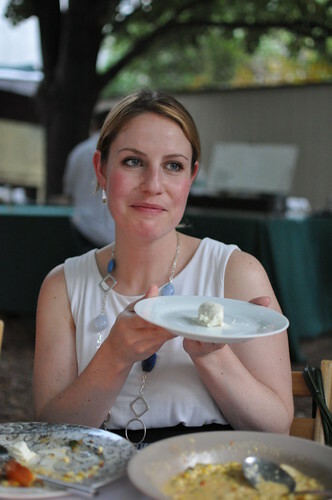 Jess presenting us with a sample of the ricotta from the cherry tomato crostini! Jim Denevan, fraternizing with the "party-ers" (that's right--we were dubbed the "party-ers" of the night)! Go us! At one point, our waiter was explaining one of the wines to us, and we were all saying how delicious that sounds, and then Jess goes, "You had me at 'next wine'." So awesome, because it's true! The last course, dessert, sea salt breton with roasted peaches, wild blueberries, sesame crème fraîche, and Bronx honey. Breton, as we were told, is a combination of pastry and shortbread--somehow, it seemed both dense and light at the same time during each bite. The simple flavors worked really nicely together--the tartness of the fruit, the sweet and creaminess of the crème fraîche, and the salty buttery-ness of the breton. 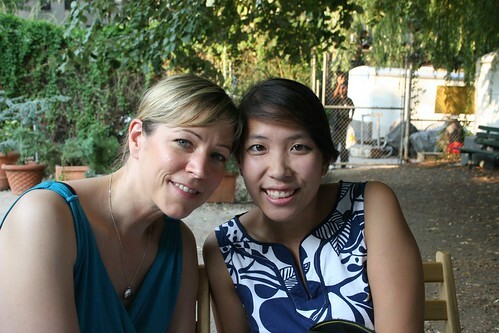 Linda and me (thanks for the photo, Jess :]). Findings: It was amazing to know that the ingredients in all five courses that night all came from local farms. The continuing tradition from that first farmer dinner during the summer of 1999 is astounding to witness and be a part of. I could definitely taste the freshness of the ingredients provided, and it proves that it is certainly possible to have a meal using only things from local sources. The concept of uniting the chefs, farmers, producers, vitners, and patrons at a "long farm table", sharing a meal with the ones sitting closest to you (a "family"), reminiscing about past, present, and future experiences surrounding food and eating, as well as enjoying wine with friends and newly made friends--so simple and opportune for all parties participating and involved. OITF helps us appreciate where our food comes from--something we may lose sight of within the world of convenience in which we live. The chefs from Print. put together a well-thought out menu, where I got to try things that I've either never tried or wouldn't normally order from a menu (e.g., Freekeh risotto, cherry tomato crostini with Ricotta). I sense a new tradition coming (count me in, Linda!). Besides, as long as the wine keeps coming, what's there not to love? 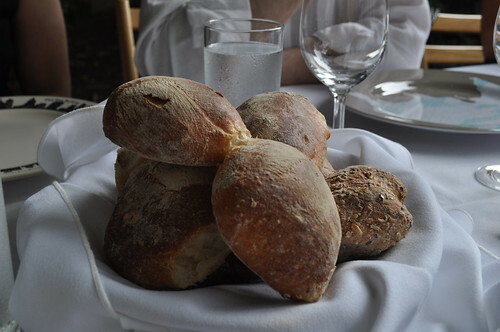 Price point: $220 for a local-farm-supplied 5-course dinner with wine pairing by local vineyard.